"It would be pretty cool." How involved are you in the TV show? I’m pretty involved. Usually in January, we write an outline for the season, and then the showrunner and I work on it together and chop it up into 10 episodes. Then we bring in the writers. And then it reaches the point of production, and that’s where I like to stand around with a goofy grin on my face and just watch because that’s not my expertise – the camera angles and all that kind of stuff. But I do love to be there when they do it. It’s totally egotistical, but it’s fun to be there when the actors and crew and producers and everything are all working in concert to realise something that started with a book I wrote. It’s a great feeling. When you write the books, you have a picture in your head of what each character looks like. Is there anyone who’s really surprised you? There are two characters who are different from the book – that would be Harry Bosch’s partner, Jerry Edgar, and the police chief, Irving. These were characters in my very first book and I concentrated so much on Harry Bosch, I think I kind of made those characters a little thin in the books. So what’s been wonderful – and I guess you could call it a surprise – is that they’re very full characters in the show. And much more interesting characters in the show than the books. And going into this I probably didn’t expect that to happen. But it starts with the writing and then the actor takes it from there, and the actors in these roles [Jamie Hector and Lance Reddick respectively] are fantastic. 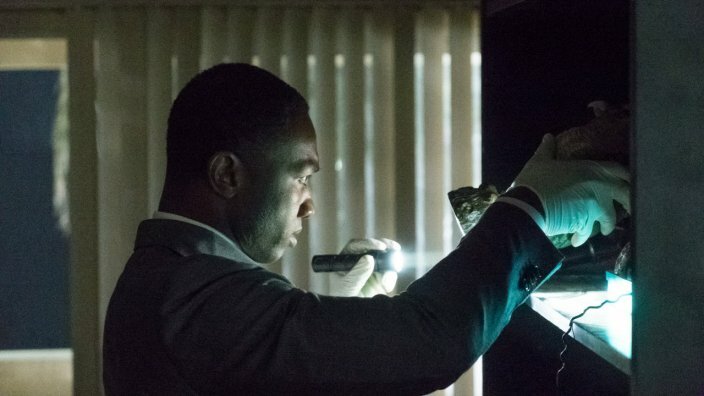 I think this would qualify as a surprise – five years ago I would think the show would be all about Bosch, but in season three, Jerry Edgar and what he goes through is really riveting. I don’t think I could have seen that coming. Jeri Ryan returns to torment Bosch (Titus Welliver) as femme fatale Veronica Allen. One aspect of season three that differs from the books is the return of Veronica Allen. How much was that just because everyone loved Jeri Ryan? Well we loved her, we loved working with her; she was great. But also we didn’t tie up that story completely. And the other aspect is her lawyer who, in the books, has a feud with Bosch, and we really liked that aspect of season two, so we wanted to bring that back. It’s all part of serialised television that, unless somebody is killed, they can come back. We have the attorney Honey Chandler, known as “Money” Chandler (Mimi Rogers), coming back in season four. It’s very cool when you can bring characters back. Bosch’s personal credo is "everybody counts or nobody counts". We live in interesting times. Does this have any special resonance right now, do you think? Well, I’ll come off as egotistical to say so, but I think it certainly does and it’s a message I wish was more widely embraced, especially in my country, where there are really big issues about policing and policing in minority communities and the high frequency of shootings in minority communities involving police. I don’t like making blanket judgements or anything, but I think that “everybody counts or nobody counts” is really basically a doctrine of being fair, treating people the way you want to be treated, and I think that gets lost in these situations and maybe if it didn’t we wouldn’t have so many of these situations. So it’s something I put in the books years ago and we play with it in the TV show, for sure. And I hope it is a message that gets out there. Do you feel that’s why people gravitate toward heroes like Bosch? He is a flawed hero but he is essentially a moral person. He’s essentially a moral person. He wants to do the right thing. He wants himself to be fair, he wants it to be a fair world, but it never is. And it’s hard to always be a moral hero and that’s certainly explored in season three when Bosch makes choices that are difficult. But not everybody can be perfect – even our heroes. And I think it’s a real reflection of the difficulty of that job. His job takes him to the dark side of humanity every day, where people do really bad stuff to other people. And if you’re doing that every day – going into that darkness – some of that’s going to get inside of you and you have to figure out what damage it’s done and what you can do about it. Season three is about the damage that’s been done to Harry Bosch and how he reacts to it, and he doesn’t always react to it by doing the right thing. Matthew McConaughey returning as the Lincoln Lawyer? All right, all right, all right. In the later books, Bosch intersects with the Lincoln Lawyer. Are there any plans to bring him into Bosch and, if so, will it be Matthew McConaughey? Now, we’re talking about all these different rights issues – it’s a real morass and it’s very hard to solve, but we are working on that because I think if someone like McConaughey says, “I want to do this,” then a lot of the legal mumbo jumbo goes away. So there’s an effort. I can’t say for sure anything will happen, but it would be pretty cool. With its depiction of LA’s dark underbelly, 'Bosch' echoes the late lamented HBO crime series. Love 'Bosch'? Get started on season 3 today! TV’s gruffest detective returns to SBS. And we're sneak previewing the first episode of its third season.